It’s 2014, and we have more choice than ever before. In 1982 (in the UK) we had 4 television channels. There was no internet (at least not in any recognisable form). And there were no laptops, tablets, or smartphones. Fast-forward 30-odd years and most of us are spending our days surrounded by gadgets. Gadgets that give us never-ending choice. What game to play? What to read? What film to watch? But are we actually any better off for all this choice? Or is too much choice driving us to distraction? Pre-internet, if you wanted a night in front of the telly, you’d check the TV guide, decide what sounded good, and watch it. 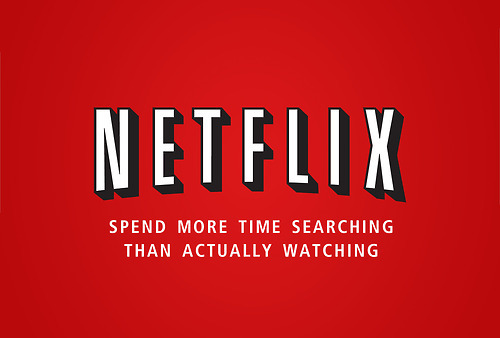 Today, you might go on Netflix. Spend half an hour deciding what to watch. Finally decide on something. Watch for five or ten minutes. Change your mind. And go back to square one. We are plagued by the thought that there’s always something more exciting somewhere else, and the resulting temptation to go and find it. Why are you even still reading this article when there’s bound to be something more interesting on Buzzfeed? If you’re still with me, congratulations. For one thing, you’re probably happier than most of us. According to Harvard Psychologists Matthew A. Killingsworth and Daniel T. Gilbert a ‘wandering mind is not a happy mind’. However, while their study focused on the effects of our minds wandering to (usually negative) thoughts; thoughts disassociated from our immediate situation, the underlying principle is kind of the same. Being distracted by the idea that there is a more interesting alternative to what we’re currently reading, watching, or doing, can’t be healthy. It means we’re unhappy or unsatisfied with our present situation. It’s the ‘grass is always greener’ effect. If we change what we’re doing/watching/reading, and realise we’re no more entertained than before, we repeat the cycle, and remain anxious and unsatisfied. When we had less choice, we chose what to watch on TV, which book to read, or what game to play, and generally, we were happy with our choice. We probably knew what the few alternatives were and knew we’d made the best decision. Knowing we’d made a good decision = happy. But choice isn’t only affecting our downtime. Choice and distraction is dramatically affecting our ability to focus at work. According to New Scientist, regular distractions cause “the average IQ to reduce by 10 points – double the amount seen in studies involving cannabis users”. In fact, too much incoming information can reduce our ability to focus to the same extent as if we had lost a night’s sleep, and there’s even evidence that modern distractions are actually rewiring our brains and damaging our attention spans. It can’t come as any real surprise then that we are supposedly more stressed than ever. Stress at work usually results from feeling overwhelmed and unable to cope – feelings that are most certainly being worsened by constant distractions. If we could close down our email, hide our phones, and just focus on the task at hand, we would probably be a lot happier at work, and get a lot more done, too. Yet in marketing we’re probably more affected by choice than most. 20 years ago it was easy to get people’s full attention. We didn’t have to compete with everyone having a world of information and entertainment at their fingertips. Today we have literally seconds to capture people’s interest. The success of social media sites like Twitter (140 character messages), and its more recent venture Vine (6 second videos), show that people want to consume information in bitesized portions. We have seconds to capture people’s attention. Bring them into a story, surprise them, or evoke an emotion – and do it quickly. If you’re writing an article, keep sentences and paragraphs short. Use subheadings, images, and numbered lists. Make content that’s easy to digest, and easy to delve in and out of. Follow Twitter’s model across your social channels. Just because Facebook allows you to ramble on, doesn’t mean you should. Involve your consumers – whether that’s asking them questions or creating something they can literally interact with; the more involved your consumers are, the longer they will stick with your content. Give people what they are looking for, and make it clear, quickly, that they’re in the right place. Don’t use misleading titles or hide answers 500 words down a page. A surplus of choice may well be decreasing our happiness, increasing our stress, and destroying our ability to concentrate. Is this making marketing harder? I don’t think so. We don’t need to change our message. We just need to change how we say it.